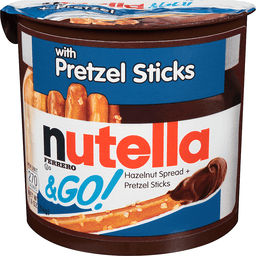 Nutella Ferrero & Go Hazelnut Spread + Pretzel Sticks. New! With pretzel sticks. Per unit. 270 Calories. It's happy to Go™. Spread the Happy™. If you love the taste of Nutella®, look for jars in the spreads aisle. Made in Canada. Pretzels: made in USA. www.nutellausa.com. ©Ferrero.